The brain stem, which is located underneath the limbic system, plays a vital role in the basic life functions of breathing, heart rate, and blood pressure. Three sections, the midbrain, the pons and the medulla, comprise the brain stem. The medulla, which is located between the pons and spinal cord, regulates breathing and heart rate. Injury to the medulla results in breathing difficulties. Medline Plus includes brain stem injury among the causes of slowed breathing. The cells in the medulla monitor the concentration of carbon dioxide in the body. If levels of carbon dioxide rise, the medulla responds by increasing the activity of the motor nerves that control the intercostal muscles and the diaphragm. The medulla makes breathing possible. The Stroke Network states that injury and subsequent swelling within the brain stem causes decreased vital capacity in breathing. Vital capacity is the maximum amount of air that a person can expel from the lungs in one breath. Compression of the medulla leads to respiratory insufficiency or apnea. According to University College London, with tonsillar herniation, the cerebellar tonsils are displaced through the foramen magnum causing compression on the medulla. Head trauma is one cause of tonsillar herniation. Respiratory insufficiency means the lungs are not taking in enough oxygen and expelling sufficient amounts of carbon dioxide to meet the needs of the cells of the body. Apnea is the term used for pauses in a normal breathing pattern. Trauma to the brain stem, especially the medulla, causes respiratory arrest. According to 2006 information provided by the Brain Injury Association of America, it is estimated 1.4 million cases of traumatic brain injury are reported in the United States each year. The degree of injury varies from mild to severe. Of these cases, 235,000 victims require hospitalization and 50,000 victims die. Respiratory arrest is a life-threatening consequence of traumatic injury to the medulla. The absence of breathing for more than five minutes may cause irreversible damage to the vital organs. 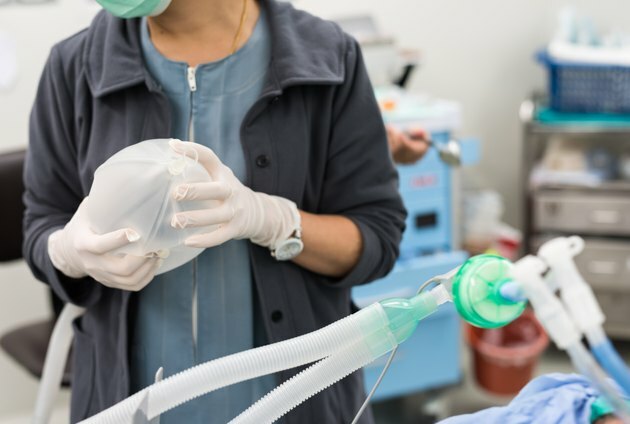 Symptoms of respiratory arrest include harsh, high pitched breathing, loss of consciousness, cyanosis, and the absence of chest movement associated with respiration.